For the former Pennsylvania Route 61 designated in the 1920s, see U.S. Route 322 in Pennsylvania. Pennsylvania Route 61 (PA 61) is an 81.801 mi (131.65 km)-long state highway in the U.S. state of Pennsylvania. The route is signed on a north–south direction, from U.S. Route 222 Business in Reading to U.S. Route 11 and U.S. Route 15 in Shamokin Dam. PA 61 meets up with Pennsylvania Route 54 in Ashland and these highways split just outside Ashland. PA 54 goes towards Mount Carmel and PA 61 heads towards Centralia. Current PA 61 was assigned in 1963, comprising the section of the decommissioned U.S. Route 122 from Sunbury to Reading. PA 61 begins at US 222 Bus. in the city of Reading in Berks County, heading west on two-lane undivided Greenwich Street, which is maintained by the city. The road intersects Centre Avenue and North 4th Street a short distance apart, at which points the route briefly splits into the one-way pair of Centre Avenue northbound and North 4th Street southbound and becomes state-maintained. At the intersection of North 4th Street and Centre Avenue, both directions of PA 61 continue northwest on two-lane undivided Centre Avenue, passing through urban areas of homes. The road becomes three lanes with one northbound land and two southbound lanes and curves north, running between residences and businesses to the west and a large cemetery to the east. The route narrows to two lanes and continues past urban development. PA 61 heads into commercial areas and widens to four lanes, crossing Norfolk Southern's Reading Industrial Track before passing to the east of FirstEnergy Stadium, the home ballpark of Minor League Baseball's Reading Fightin Phils. The road heads into Muhlenberg Township and becomes a divided highway as it reaches a partial cloverleaf interchange with the PA 12 freeway (Warren Street Bypass). Past this interchange, the route continues north into suburban areas as Pottsville Pike, a four-lane divided highway with some intersections controlled by jughandles. PA 61 heads past businesses and passes under Norfolk Southern's Reading Line. The road becomes undivided and runs through more commercial areas. The route briefly becomes a divided highway again at the Bellevue Avenue intersection, heading to the west of the Reading Outer Station along the Reading Blue Mountain and Northern Railroad. The highway transitions to a three-lane road with a center left-turn lane and passes under the Reading Blue Mountain and Northern Railroad's Reading Division line. PA 61 runs past businesses and industrial development before it heads through the community of Tuckerton, where it passes homes and businesses. The road becomes a four-lane divided highway as it comes to a partial cloverleaf interchange with the US 222 freeway. Following this, the route enters Ontelaunee Township and runs along the east bank of the Schuylkill River as it passes through the community of Ontelaunee. PA 61 heads farther from the river and passes under a Reading Blue Mountain and Northern Railroad line, heading into industrial areas. The road heads near more commercial development and curves northwest, crossing Maiden Creek. The route runs through farmland and comes to an intersection with the western terminus of PA 73. Past this intersection, PA 61 passes a mix of businesses and fields before it enters the borough of Leesport. Here, the road becomes four-lane undivided South Centre Avenue and runs past homes and some businesses. The route becomes North Centre Avenue and passes more residences, running to the east of a Reading Blue Mountain and Northern Railroad line. PA 61 northbound past the northern terminus of PA 662 in Shoemakersville. PA 61 leaves Leesport for Ontelaunee Township again, where it becomes four-lane divided Pottsville Pike and passes a few businesses. The road curves north and heads through a mix of fields and woods with some residential and commercial development to the east of the railroad tracks, with the Schuylkill River further to the west, bending northeast and entering Perry Township. The route curves north and continues through rural land with some industrial development, with the river and railroad tracks heading further to the west. PA 61 runs through more farmland and woodland before it becomes the border between the borough of Shoemakersville to the west and Perry Township to the east, heading past businesses and coming to an intersection with the northern terminus of PA 662. From here, the road fully enters Shoemakersville before crossing into Perry Township, heading north-northwest past homes and businesses with some farmland. The route becomes undivided and curves north in a wooded area, entering Windsor Township and passing more roadside development. PA 61 heads into the borough of Hamburg and runs past businesses as a four-lane divided highway, coming to an intersection with South 4th Street which heads north into the center of the borough. From here, the road curves northwest as an unnamed road and passes over a Reading Blue Mountain and Northern Railroad line, heading into wooded areas with the Schuylkill River to the southwest and industrial development to the northeast. The route passes over the river, entering Tilden Township, and continues over Old Route 22 and the Reading Blue Mountain and Northern Railroad's Reading Division line. PA 61 comes to a partial cloverleaf interchange with I-78/US 22 and continues past businesses, heading east of a 250,000-square-foot (23,000 m2) Cabela's store. The road runs through farm fields before it enters forested areas, crossing over the Schuylkill River Trail and coming to a bridge over the Reading Blue Mountain and Northern Railroad's Reading Division line and the Schuylkill River. Upon crossing the Schuylkill River, PA 61 enters the borough of Port Clinton in Schuylkill County and passes over the Appalachian Trail before crossing through a gap in forested Blue Mountain along with the river. The road becomes Center Street and curves north, running between homes and some businesses to the west and the mountain to the east. The route heads into West Brunswick Township, becoming Centre Turnpike and heading north through forested mountains with the Little Schuylkill River to the west and a tract of Weiser State Forest to the east. PA 61 heads through a mix of fields and woods and passes over the river and the Reading Blue Mountain and Northern Railroad's Reading Division line before coming to PA 895 at a jughandle-controlled intersection in the community of Molino. At this point, PA 895 joins PA 61 for a concurrency and the two routes head northwest, running through a mix of farm fields and woods. The road heads into the borough of Deer Lake passing through wooded areas with nearby residential neighborhoods. PA 895 splits from PA 61 by heading southwest, with PA 61 splitting into a one-way pair carrying two lanes in each direction and heading north past development, leaving Deer Lake for West Brunswick Township and heading through the community of Pinedale. The route continues northwest past fields and woods with some residential and commercial development. PA 61 curves to the west and remains a four-lane undivided road before becoming a three-lane road with one northbound lane and two southbound lanes and entering North Manheim Township. The route becomes three lanes with two northbound lanes and one southbound lanes before transitioning to a four-lane road as it passes south of the borough of Orwigsburg, briefly becoming three lanes with one northbound lane and two southbound lanes at the Greenview Road intersection. The road becomes a four-lane divided highway and reaches PA 443 at a jughandle-controlled intersection. At this point, PA 443 heads west for a concurrency with PA 61, and the two routes head west-southwest through business areas as Center Avenue. The road passes to the south of the Penn State Schuylkill campus before it continues past more development. The two routes enter the borough of Schuylkill Haven and become a four-lane undivided road, passing homes. PA 443 splits to the south and PA 61 continues west, passing businesses and crossing back into North Manheim Township. The route widens to a four-lane divided highway with several intersections controlled by jughandles and comes to an intersection with the northern terminus of PA 183 east of the borough of Cressona. Here, the road curves north and becomes unnamed, passing between businesses to the west and woodland to the east. PA 61 continues north a short distance to the east of the Schuylkill River and passes through a narrow valley straddling Second Mountain and Sharp Mountain. Farther north, the route continues through wooded areas with some development and bends northwest, passing through a section of the borough of Palo Alto before it passes over a Reading Blue Mountain and Northern Railroad line and enters the city of Pottsville. Here, the road becomes South Claude A. Lord Boulevard and passes near commercial development, crossing the Schuylkill River before coming to an intersection with US 209. Past this intersection, PA 61 becomes a four-lane undivided road and runs past businesses to the east of downtown Pottsville, becoming North Claude A. Lord Boulevard after crossing East Norwegian Street. The route heads near residential and commercial development with some wooded areas, becoming a divided highway and curving to the northeast. The road turns north and leaves Pottsville for Norwegian Township, passing through woodland as Pottsville-St. Clair Highway. PA 61 heads into business areas and passes to the east of Fairlane Village Mall, entering East Norwegian Township. The route bends north-northwest and enters the borough of St. Clair, where it becomes Joseph H. Long Boulevard and runs between wooded areas to the west and residential areas to the east, curving to the north and passing west of a shopping center. PA 61 leaves St. Clair for New Castle Township and becomes an unnamed four-lane undivided highway that heads into forested mountains to the west of Mill Creek. The road curves northwest and becomes a three lane road with one northbound lane and two southbound lanes that reaches the community of Darkwater, where it turns to the north. The route becomes four lanes again and continues through forests, becoming a divided highway. PA 61 turns northwest and the median widens as it winds north through mountainous areas, becoming Skyline Drive and crossing into Blythe Township. The divided road curves to the northwest through more woodland before it comes to an interchange that provides access to the Schuylkill Mall to the west of the road. The median of the route narrows and it continues into Ryan Township, coming to a cloverleaf interchange with I-81. Broad Street (PA 61) in Fountain Springs. Past this interchange, PA 61 enters West Mahanoy Township and becomes South Lehigh Avenue, heading north-northwest past businesses. The route narrows to a two-lane undivided road and heads into the borough of Frackville, where it is lined with homes and a few businesses. In the commercial downtown, PA 61 turns west-southwest onto West Oak Street, with PA 924 continuing north on South Lehigh Avenue. PA 61 continues past residences and a few businesses before it leaves Frackville for Butler Township and runs through the residential community of Englewood. The road heads into forested mountain areas and winds to the west, passing to the north of Ashland Reservoir before gaining a second southbound lane. The route straightens out and heads west as a three-lane road with a center left-turn lane, passing some homes. Farther west, the road becomes three lanes with one northbound lane and two southbound lanes before narrowing to two lanes. PA 61 becomes Fountain Street and heads west-southwest to the community of Fountain Springs, where it runs through residential areas and turns northwest onto Broad Street. The road gains a center turn lane and runs through forests with some homes, curing to the north. The route enters the borough of Ashland and becomes South Hoffman Boulevard, passing near commercial development and curving northeast to cross a Reading Blue Mountain and Northern Railroad line and Mahanoy Creek. PA 61 turns north and becomes a two-lane divided highway that runs through residential areas, coming to an intersection with PA 54. At this point, PA 61 turns west to become concurrent with PA 54 on two-lane undivided Centre Street, heading through the commercial downtown of Ashland. Farther west, the road runs past homes. PA 61 splits from PA 54 by turning north onto four-lane divided North Memorial Boulevard, passing to the west of an industrial area before heading into forests. PA 61 enters Conyngham Township in Columbia County and heads northeast through dense forests as an unnamed four-lane undivided road. Farther northeast, the route narrows to a three lane road with one northbound lane and two southbound lanes. PA 61 curves east and becomes two-lane undivided Byrnesville Road, which is designated SR 2002. The former divided highway alignment of PA 61 past this point has been closed because of the Centralia mine fire that has made the road unsafe to travel on. The closed section of the road is used by pedestrians and bicyclists and is covered in graffiti. PA 61 follows Byrnesville Road northeast through forests before passing through the abandoned community of Byrnesville. The route curves northwest through more woods and rejoins the closed alignment, at which point SR 2002 ends. At this point, PA 61 enters the borough of Centralia, which has largely been abandoned because of the mine fire, as two-lane undivided Locust Avenue. The road runs north through abandoned areas of the borough which have been overgrown with trees. PA 61 turns west onto West Centre Street, with PA 42 continuing north along Locust Avenue. From here, the route heads west through more abandoned sections of Centralia. The road leaves Centralia for Conyngham Township again and becomes a four-lane divided highway, heading through forested areas and passing to the south of a large coal mine. PA 61 enters Mount Carmel Township in Northumberland County and reaches a pair of jughandles at the county line before continuing west through forested areas. The route enters the borough of Mount Carmel and becomes two-lane undivided East 5th Street, lined with homes. PA 61 turns north onto four-lane South Market Street, passing residences and businesses. The road becomes North Market Street at the intersection with East 3rd Street. The route turns west onto two-lane East Mount Carmel Avenue and is lined with homes. The road name changes to West Mount Carmel Avenue after the intersection with North Oak Street. PA 61 turns north onto North Poplar Street and crosses back into Mount Carmel Township, curving west and widening to a four-lane unnamed road that passes north of the residential community of Atlas. The road heads past businesses and crosses PA 54 in the community of Strong. The route passes north of homes in Strong as Front Street before it runs through wooded areas with some residential and commercial development. PA 61 heads into the borough of Kulpmont, becoming Chestnut Street and running past homes and businesses. The road narrows to two lanes and runs through the commercial downtown of Kulpmont before running through more residential areas. The route leaves Kulpmont for Coal Township and becomes an unnamed four-lane road, passing through forested areas with some businesses. PA 61 passes to the north of the community of Ranshaw and comes to an interchange with the western terminus of PA 901, which provides access to Ranshaw along with the community of Coal Run to the north. Following this interchange, the road continues through wooded areas and businesses, with several intersections controlled by jughandles, passing north of the community of Marshallton. The route enters the city of Shamokin and becomes two-lane undivided Mt. Carmel Street, heading northwest into residential areas. PA 61 turns west onto East Sunbury Street and runs past more homes and a few businesses, curving southwest. The road becomes West Sunbury Street at the North 8th Street intersection and comes to a junction with the northern terminus of PA 125. From here, the route passes more development and turns northwest onto North 6th Street. PA 61 leaves Shamokin for Coal Township again, becoming an unnamed road and passing over the Shamokin Valley Railroad and the Shamokin Creek before coming to an intersection with the northern terminus of PA 225. The road curves north and runs through forested areas, with PA 225 parallel to the west and the creek and railroad line parallel to the east as it traverses a gap in Big Mountain. PA 225 curves away to the west and the route bends northwest and widens to a four-lane divided highway, passing southwest of the residential community of Uniontown and curving to the west. PA 61 crosses the Shamokin Creek and turns to the north, heading through a gap in forested Little Mountain with the creek to the west and the Shamokin Valley Railroad to the east and entering Ralpho Township. The road passes commercial development and a coal mine in the community of Weigh Scales before it crosses to the west side of the Shamokin Creek, at which point it enters Shamokin Township. The route winds north through more woodland with some commercial areas, with the Shamokin Valley Railroad and the Shamokin Creek to the east. PA 61 curves northwest and intersects the southern terminus of PA 487 in the community of Paxinos. From here, the road curves west runs to the north of the residential community of Sunfftown before narrowing to a two-lane undivided road and heading through woodland. The route continues west through woodland with some farm fields and homes, running through the community of Stonington and bending to the northwest. PA 61 heads west and becomes the border between Upper Augusta Township to the north and Rockefeller Township to the south, passing through forests with some fields and residential development. The road fully enters Upper Augusta Township and runs through residential areas with some nearby farmland and woodland, becoming State Street. The route comes to an intersection with the northern terminus of PA 890 in the community of Hamilton. From here, PA 61 turns north and crosses the Shamokin Valley Railroad, at which point it enters the city of Sunbury. The road becomes Market Street and curves west, coming to a bridge over the Shamokin Creek. The route passes near businesses and bends southwest, coming to an intersection with the southern terminus of southbound PA 61 Truck at Wolverton Street. PA 61 curves west and becomes lined with homes, bending to the west-northwest and passing a mix of homes and businesses. The road enters the commercial downtown of Sunbury and intersects the beginning of northbound PA 61 Truck at North 5th Street. The route passes through more of the downtown and crosses Norfolk Southern's Buffalo Line, at which point it splits into a one-way pair as it runs through a plaza in the center of town and passes north of the Northumberland County Courthouse. PA 61 becomes a two-lane road again and passes homes before it reaches an intersection with PA 147 on the east bank of the Susquehanna River. At this point, PA 61 turns south-southwest for a concurrency with PA 147 on South Front Street, intersecting the beginning of southbound PA 61 Truck at Chestnut Street. The two routes continues south between the river to the west and a mix of homes and commercial areas to the east. Farther south, the road runs to the west of residential areas. PA 61 splits from PA 147 at an interchange, heading west as a four-lane undivided road to cross the Susquehanna River on the Veterans Memorial Bridge, running through Upper Augusta Township. Upon crossing the river, the route enters the borough of Shamokin Dam in Snyder County and reaches its northern terminus at a trumpet interchange with US 11/US 15. In 1926, what is now PA 61 became part of U.S. Route 120, from US Routes 11 and 111 in Shamokin Dam to U.S. Route 22 in Reading. In May 1935, US 120 was truncated to terminate at US 220 in Lock Haven. US 122 was designated in April 1935 to run from US 1 in Oxford north to US 11/US 111 in Sunbury, replacing PA 42 between Oxford and Reading and US 120 between Reading and Sunbury, effective in May 1935. US 122 first truncated to Morgantown in 1956, and then removed entirely in 1963; the part south of Reading became PA 10 while the remainder of former US 122 became PA 61. By 1950, the roadway around Centralia was widened to 4 lanes. Also, U.S. Route 15 was moved along the westside of the Susquehanna River, and Pennsylvania Route 14 was routed along what is now PA 147. A view of the closed, damaged section of PA 61 south of Centralia. Because of the long-term coal mine fire in Centralia, the original branch of Routes 54 and 61, which went from Centralia to Ashland, has been permanently closed because the road has severely opened up and buckled extensively. This branch was repaired in 1983 for $500,000; then in 1992 it was deemed too expensive to repair again. In 1994, the branch was permanently closed, and as a result of this, graffiti were scattered along the closed portion of the roadway. 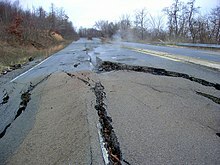 In 1999, Byrnesville Road (Quadrant Route 2002), located directly south of the closed section of PA 61, was upgraded and now carries PA 61, bypassing the section of PA 61 which was damaged by the underground mine fire in Centralia. PA 54 formerly ran concurrent with PA 61 through Centralia but was rerouted along Pennsylvania Route 901 and three quadrant routes in 1999, completely bypassing Centralia. Nowadays, only PA 61 goes through Centralia while PA 54 now goes directly from Ashland to Mount Carmel along the aforementioned alignment via PA 901. The road signs for PA 54 were removed from Centralia several years ago. Routes 54 and 61 meet up again at an intersection just outside Mount Carmel. As part of the Central Susquehanna Valley Transportation Project, PA 61 is planned to continue westward from its current northern terminus, ending instead at a junction with a new limited-access roadway carrying U.S. Route 15. Instead of joining with PA 147 briefly in Sunbury, the two will run together from the southern end of the current duplex to the new northern terminus at US 15. 98.730 PA 901 east to I-81 – Ranshaw, Coal Run Interchange; western terminus of PA 901. Pennsylvania Route 61 Truck (PA 61 Truck) is a truck route of PA 61 bypassing a weight-restricted bridge over Laurel Run in Muhlenberg Township, on which trucks over 34 tons and combination loads over 40 tons are prohibited. The route follows PA 12, PA 183, and US 222. PA 61 Truck was signed in 2013. Pennsylvania Route 61 Truck (PA 61 Truck) is a truck route of PA 61 in Sunbury that helps larger vehicles avoid a narrow plaza area and a tight intersection with PA 147. The northbound truck route splits from PA 61 in the downtown area by heading north on two-lane undivided North 5th Street for two blocks. Northbound PA 61 Truck turns west-northwest onto one-way Arch Street, passing a mix of homes and businesses and crossing Norfolk Southern's Buffalo Line. The northbound truck route ends at PA 147 on the east bank of the Susquehanna River, which heads south to provide access to PA 61. The southbound truck route begins at PA 61/PA 147 on the east bank of the Susquehanna River, heading east-southeast on one-way Chestnut Street. Southbound PA 61 Truck runs past residences and businesses, crossing Norfolk Southern's Buffalo Line. The truck route continues southeast onto Wolverton Street, passing between homes to the north and industry to the south and curving east. The road runs to the north of the Shamokin Valley Railroad and bends northeast past more homes and commercial establishments. Southbound PA 61 Truck ends at an intersection with PA 61 in the eastern part of Sunbury. ^ a b "State Eliminating Route 14 Designation". Williamsport Sun-Gazette. April 1, 1963. p. 5. Retrieved August 11, 2015 – via Newspapers.com. ^ a b c d e f g h i j k l m n o p Google (January 31, 2016). "overview of Pennsylvania Route 61" (Map). Google Maps. Google. Retrieved January 31, 2016. ^ a b c Berks County, Pennsylvania Highway Map (PDF) (Map). PennDOT. 2015. Retrieved January 25, 2016. ^ a b c d Schuylkill County, Pennsylvania Highway Map (PDF) (Map). PennDOT. 2015. Retrieved November 11, 2015. ^ a b c d e Columbia County, Pennsylvania Highway Map (PDF) (Map). PennDOT. 2015. Retrieved November 16, 2015. ^ a b "The Centralia Mine Fire - Frequently Asked Questions/Answers". Pennsylvania Department of Environmental Protection. p. 5. Retrieved January 31, 2016. ^ Lepard, Clay (July 8, 2015). "Old Route 61 near Centralia Covered with Graffiti". Scranton, PA: WNEP-TV. Retrieved January 31, 2016. ^ a b c d e Montour County and Northumberland County, Pennsylvania Highway Map (PDF) (Map). PennDOT. 2015. Retrieved January 22, 2016. ^ Snyder County and Union County, Pennsylvania Highway Map (PDF) (Map). PennDOT. 2015. Retrieved January 31, 2016. ^ a b "Highway Route Number Changed". Shamokin News-Dispatch. Shamokin, PA. May 31, 1935. p. 3. U.S. Route 122 will designate the road from Oxford, on U.S. No. 1, in Chester county, continuing northward through Chochransville, Honey Brook, Reading, Hamburg, Pottsville, Frackville, Mount Carmel, Shamokin and Sunbury, joining U.S. Nos. 11 and 111 at Northumberland. This replaces No. 42 entirely and U.S. No. 120 south of Lock Haven. ^ Central Pennsylvania Map (Map). Pennsylvania Department of Highways. 1929. Retrieved 2007-07-24. ^ Allentown, Bethlehem, Marcus Hook, Chester, Reading, and Wilmington (DE) map (Map). Pennsylvania Department of Highways. 1929. Retrieved 2007-07-24. ^ "State to Change Route Numbers". The Plain Speaker. Hazleton, Pennsylvania. April 18, 1935. p. 12. Retrieved January 13, 2016 – via Newspapers.com. ^ State map front side (PDF) (Map). Pennsylvania Department of Highways. 1940. Archived from the original (PDF) on 2011-07-05. Retrieved 2007-07-24. ^ State map front side (PDF) (Map). Pennsylvania Department of Highways. 1950. Archived from the original (PDF) on 2011-07-05. Retrieved 2007-07-24. ^ Currie, Tyler (April 2, 2003). "Zip Code 00000". The Washington Post. Retrieved February 11, 2010. ^ Google (February 3, 2016). "overview of Pennsylvania Route 61 Truck Reading" (Map). Google Maps. Google. Retrieved February 3, 2016. ^ "Risk-Based Bridge Postings - State and Local Bridges" (PDF). Pennsylvania Department of Transportation. October 8, 2013. Retrieved January 20, 2016. ^ Google (January 31, 2016). "overview of Pennsylvania Route 61 Truck Sunbury northbound" (Map). Google Maps. Google. Retrieved January 31, 2016. ^ Google (January 31, 2016). "overview of Pennsylvania Route 61 Truck Sunbury southbound" (Map). Google Maps. Google. Retrieved January 31, 2016. Wikimedia Commons has media related to Pennsylvania Route 61. This page was last edited on 13 August 2018, at 04:25 (UTC).